Ella Wheeler was born on a farm in Johnstown, Wisconsin, and grew up near Madison. She started writing poetry at a very early age, and was a published poet by the time she graduated from high school. She attended a district school and one term at the University of Wisconsin. Her most famous poem, "Solitude," with its now-classic lines, "Laugh, and the world laughs with you; Weep, and you weep alone," was first published in 1883 in The New York Sun and then in the collection Poems of Passion (1883). In 1884, she married Robert Wilcox, with whom she lived in Meriden, Connecticut, New York City, and the Short Beach section of Branford, Connecticut. Their home became a gathering place for literary and artistic friends. Her works were popular in her own day, especially in the New Thought Movement. Ella Wheeler Wilcox is currently considered a "single author." If one or more works are by a distinct, homonymous authors, go ahead and split the author. 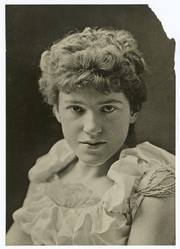 Ella Wheeler Wilcox is composed of 8 names. You can examine and separate out names.